Interval - The Augmented First Inversion in 3 Easy Steps. Why am I writing this Blog on the Augmented First Inversion? Simple - 3 years ago, I would not have been able to write an interval of an Augmented First Inversion correctly and with confidence (especially if it was written as a Harmonic Interval). And, being dyslexic, figuring it all out "in my head" was often confusing. Augmented and diminished intervals and inversions are introduced in the Ultimate Music Theory Intermediate Rudiments Workbook. Even though I've been teaching for 30+ years, there are still concepts that I struggle with. I decided to share these 3 Easy Steps to writing an Augmented First Inversion with you. I hope that someone else out there will have the same "Ah-Ha - I Get It" moment that I had. Following a Step-Stone Method helps students see the logical process and be successful. Students (and Teachers) have their own Learning Style. Not every student is able to do their theory steps "in their head". Many students need to write down the steps in order to get the answer. Using the Ultimate Music Theory Whiteboard can be a lifesaver - especially for Visual and Kinesthetic Learners. (And it is good for the environment - no more scrap paper going into the garbage!) If you have dyslexia in any form, using the Whiteboard will make learning easier. On a personal note - when I see silly boo-boos in the written work of many of my students, I know right away what they did! When I ask them "Did you use your head or your hands" they almost always admit that they were too lazy to get their Whiteboard out. They tried to "see, hear and feel" the steps to find the answers in their head and, of course, they made silly boo-boos! If you have a student who struggles to invert in their head, follow these 3 steps to write the Augmented First Inversion correctly every time. Identify which of the two notes is the lower note (has a lower pitch) and which is the upper note (has a higher pitch). 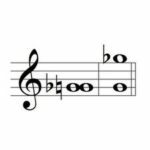 Remember, the first note of a Melodic Interval is not always the lower note. The lower note and the upper note switch places. The lower note in the Augmented First becomes the upper note in the inversion. The upper note in the Augmented First becomes the lower note in the inversion. Write the notes of the inverted interval on the Staff. Voila! You did it! Wasn't that easy? Pop Quiz Question #1: What does an Augmented First invert to? 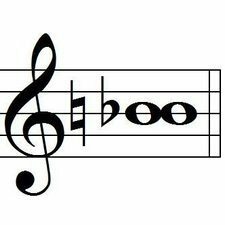 Pop Quiz Question #2: When writing a Harmonic Augmented First, which note is written first? Pop Quiz Question #3: Why is it impossible to have an interval of a diminished First? If you hesitated on any of those questions or if you are not 100% positive of the answers, it is OK! It just means that there are probably gaps in your Theory Foundation (and if you are reading this blog, then you - like me - are interested in filling these gaps with knowledge and confidence). 3 years ago, I would not have been able to answer Questions #2 and #3! Step #1 to Become a Confident Theory Teacher - Purchase the Ultimate Music Theory Complete Rudiments Workbook and Answer Book. Then start working through the Workbook. Do every single page. Answer every single question. Mark every single page and every single question using your Answer Book. (You just might have been doing something incorrectly for years and never knew it...like me and Modes!) I guarantee that you will feel like a stronger more confident Theory Teacher when you finish your Complete Workbook! 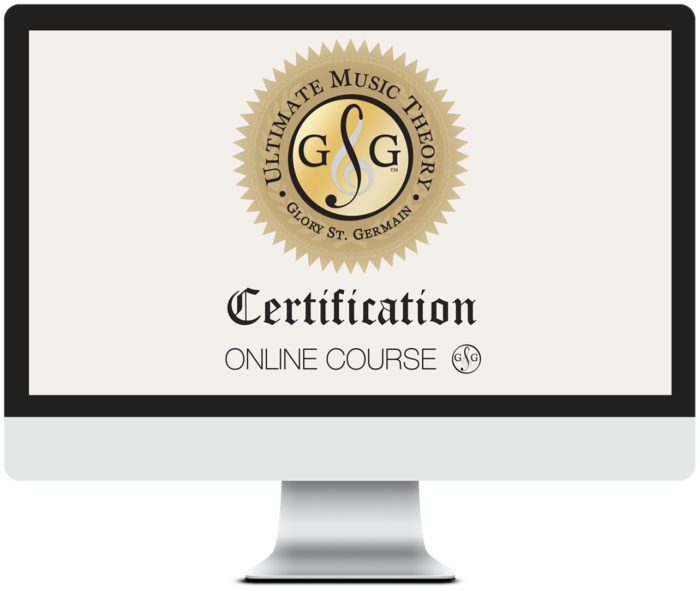 Step #2 to Become a Confident Theory Teacher - Take the Ultimate Music Theory Certification Course. Do not hesitate - register now. Work on your own time at your own pace. I guarantee that this is not just about "theory" - it will change your teaching, your relationship with your students and your family, and you will find confidence that you never even knew that you had! Step #3 to Become a Confident Theory Teacher - Explore our site! Have you downloaded the free exams for your students? Have you watched the UMT Teach Rhythm and Rests Course? Have you watched the Teach Intervals Course? Why? Because you are worth it. You deserve to feel strong and confident 24 hours a day, 7 days a week! P.S. - Join the conversation. Is there a concept that you do not feel 100% confident about? Let me know! I just may blog about it.